The Spectre/Meltdown vulnerabilities could allow unauthorized actors to steal sensitive information such as passwords, emails and credit card information from basically any computer/server. In these cases there is no need to investigate any further whether you are affected or not, you most probaby are! Without going too technical, the Spectre/Meltdown bugs affect almost any machine running a modern CPU which means that IT organizations worldwide must take immediate action to secure their environment. 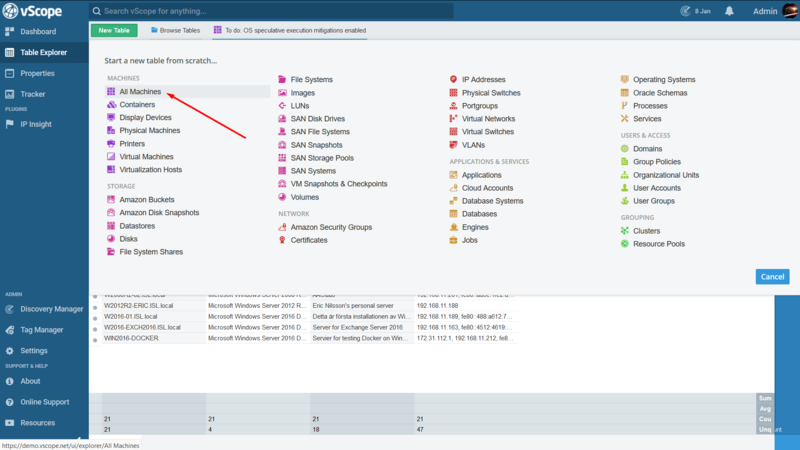 A short background – How can vScope help? With the help of vScope, organizations will always have a reliant and accurate inventory of their IT at hands. This is relevant in many cases, but especially when it comes to quickly investigating configurations across the environment, such as finding the Spectre/Meltdown vulnerabilities. In this post you will find easy help with investigating the impact, progress and resolution of the Spectre/Meltdown vulnerabilities using vScope. This requires no prerequisites, scripting skills or any form of extensive knowledge within security best practice. 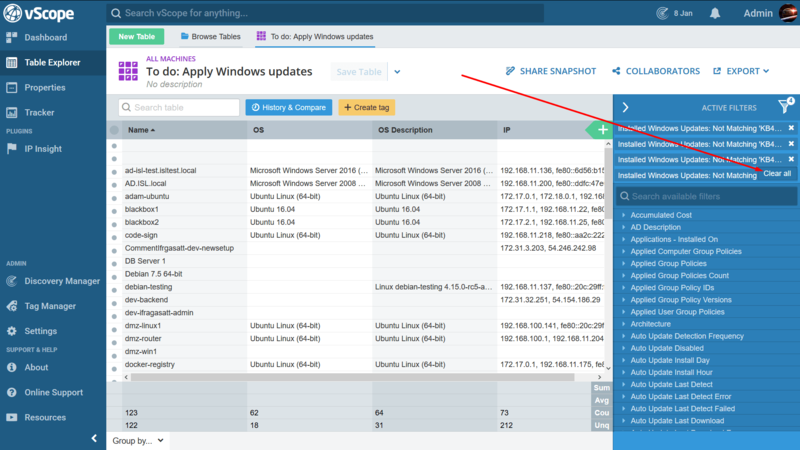 Notice that we will focus on Windows investigation in this post, but for the record vScope also supports Linux and ESXi investigations (See under Tracker heading). What do we need to know to get started? 1. What machines have not been updated with the critical Windows update? 2. What machines do not have the fix activated? 3. What machines are missing critical firmware update? 1. Which servers have not been patched with the critical security update? When the information about Spectre/Meltdown got public, Google, Microsoft, HP, Apple and other companies released patches in order to mitigate the flaws. So, the most obvious thing to start looking for is whether or not our machines have been updated or not? From that list, apply the necessary Windows updates. 2. What machines do not have fix activated? There is a registry key value (True/False) stating whether or not the security update has been fully installed. If it is not enabled, we need to make necessary configuration changes to enable full protection! It is important to ensure that a manufacturer’s update (BIOS) has been installed on the machine. 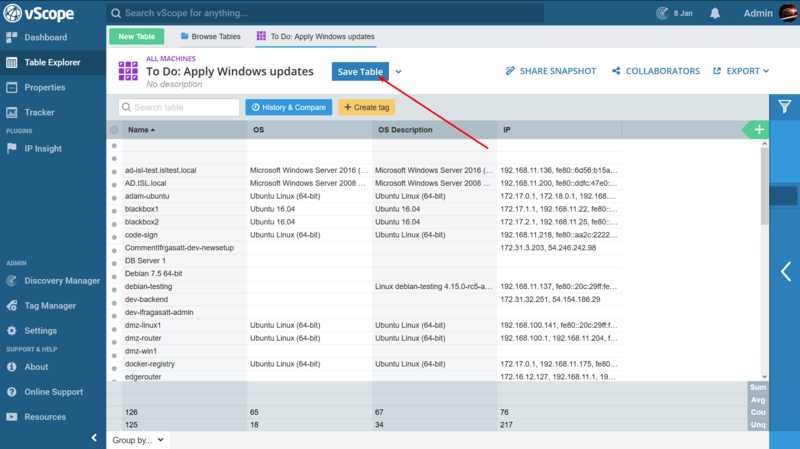 This information is not available in vScope right now, but we will add this information in just a few days (your vScope will automatically be updated, unless that option has been turned off). NOTICE New patches will supersede the listed patches above, meaning that newer patches will replace the ones listed here one from time to time as Microsoft releases updates. Notice that a double click in the filter box makes it a “not”. The resulting table lists all machines that do NOT have the critical patch installed. That’s basically it for the first step. To make the report even more relevant we can add some columns about OS, OS description and IP. From an over viewing perspective, this list shows us what servers need Windows updating to solve this specific situation. A good start! 2. Has the fix been activated? The result shows every machine that is not fully protected due to missing registry key. A very serious misconfiguration, so we need to take some actions here. Start by saving the table. Share the table with anyone interested (notice that these individuals need to have a vScope account in order to access the report). And that was really the hardest part of this tutorial. The reports we’ve built in this tutorial will automatically be updated whenever a discovery is finished. 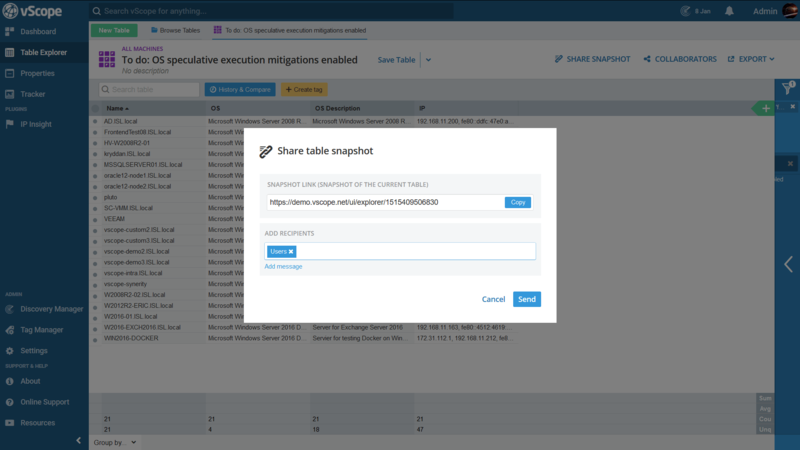 This makes these reports perfect, not only for the identification process, but also for follow ups of how the Spectre/Meltdown vulnerabilities are mitigated by your organization! NOTICE For a Linux user you might want to look into the tags OS kernel release or CPU_bugs but I will leave that for practice in this text. Thanks, but can we do it faster? Actually, yes! 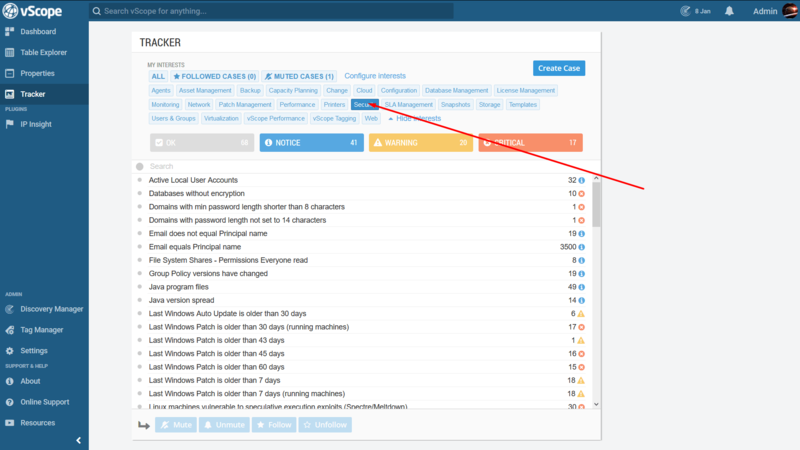 Even though this audit was done in just a few minutes, vScope will automatically help you with this issue by highlighting machines in so called Tracker cases. Let’s look into Tracker and see how that works. 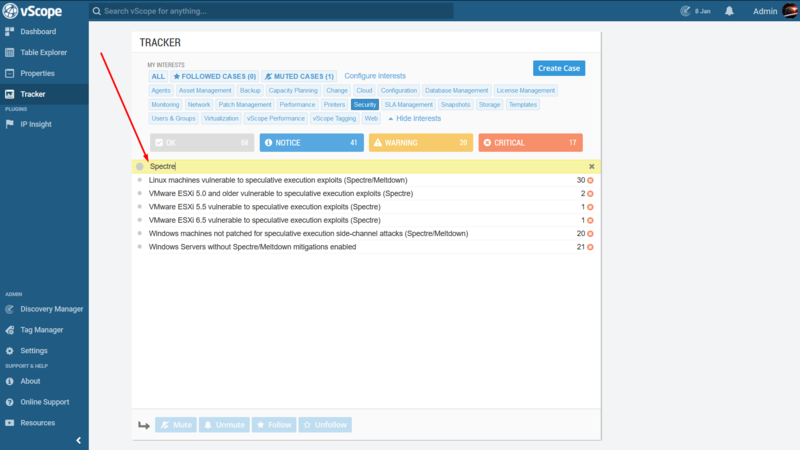 The most convenient way to investigate the impact of the Spectre/Meltdown vulnerabilities is to use Tracker. Tracker is a bundled smart analysis of your IT-infrastructure and is designed to highlight relevant information for professionals, for better and more secure IT. 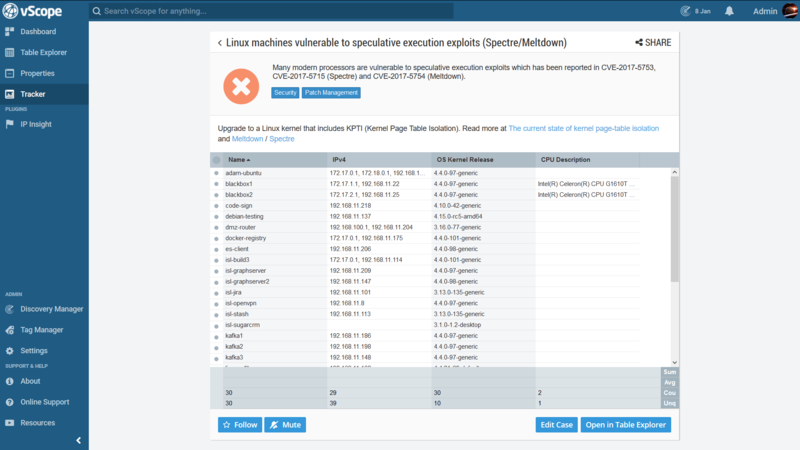 The resulting list shows you the cases where found machines have been found to be exposed to either the Spectre or Meltdown vulnerability. Notice that Tracker contains cases for both Windows and Linux, as well as ESXi. Double clicking a case will take you to the details page, where you can find out more information. That’s it for now. You are left with one final task: All major microprocessor manufacturers have already released, or are about to release fixes for Spectre/Meltdown. But do you know if any server or laptop in your environment is from a minor manufacturer? Have you checked if they have released a fix? With the help of vScope, you can list all machines that have CPU:s not manufactured by INTEL, ARM or AMD. Just look for the CPU Description tag to identify them. We have different trials and a free product of vScope. Contact us to find out more.